Well, it is about time, isn’t it? The NHibernate Profiler started about a year ago, and I estimated it at about three months of development. We released the public beta version in that time frame, and I think that we could have called in v1.0 then. In the last six months we worked on adding new features (filters, alerts, detecting caching, etc), significantly improved performance and in general worked on polishing the product. There are always more things to do, but at some point you have to cut the umbilical. 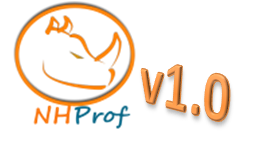 NH Prof contains everything that I wanted there to be in the first version, provides an enormous wealth of information about your NHibernate applications and can guide you toward optimal NHibernate usage. This twit just flashed by, and I think that I can honestly say that this was the target and purpose of NH Prof.
NHProf is my secret time saving weapon.. The downside of NHProf, my manager give me less and less time for optimalisations because they noticed how fast I work..
Congrats Ayende on a great and useful product !!!! I bought it earlier today because I know that I'm gonna use it soon. I'm an idiot... I always hear NH Prof and think NH Professor. It is so smart about NH and teaches you. Congrats Oren! Best software purchase I have made this year. Congratulations! Already bought it, using it, and loving it. Congrats Oren, It's a must for every developer who is using NHibernate as an ORM . Keep up the good work. Congrats, Ayende. I just bought a copy and am wondering about the semantics of "1 License" with regard to installation. Can I use my single license for working with NH Prof on my computer at work and my computer at home? Jetbrains(Resharper) allows it while MS Visual studio does not and I am wondering what your take on this is. Congratulations Oren, Rob, Chris and community for making such an awesome profiling swiss army knife! Congrats Oren, Rob and Christopher! You make it seem like “starting up” is a walk in the park…. What do you mean by starting up? Created a brand new product with 3 devs in less than a year. Registered a new firm. Not typical startup lessons. No motivational speeches. Makes it look all so simple. I am sure you are “Break Even” even before v1.0 was released.